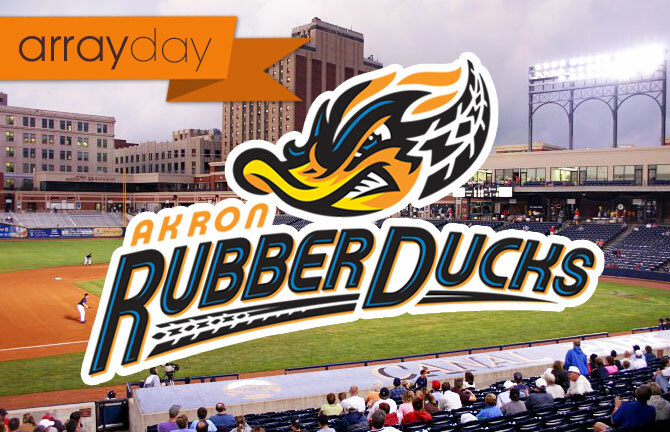 The Array team decided it was high-time to take in a ballgame and cheer on our home town Akron RubberDucks. With summer drawing to a close (already?! ), we welcomed the opportunity to take in some rays, great food and beer! We got to cheer on the home team from The Game Grill + Bar (www.thegameakron.com), and enjoyed watching local day camp kids in the ‘splash zone’ provided by the Akron Fire Department. As fellow Akronites, it never gets old seeing this awesome community come together for a good time. The afternoon game was a welcome break from the daily grind, and offered us some much needed time to kick back and relax as one big happy family! There’s something to be said about getting out of the office – after all, what better way to get the creative juices flowing than with a refreshing brew at the ball park? Even though the RubberDucks fell to the Erie Seawolves, it didn’t put a damper on our spirits, as a fantastic view and even better company made it a great time all-around. For more information, visit akronrubberducks.com and check out their schedule for the 2015 season.